View Poll Results: What type of joystick do I use? I am new here (maybe a month or two), and enjoying every second of it. Lots of fun, great pilots, and most of all, great community. I am still a newbie, trying hard to improve my flying skills. I am a real time pilot, and this sim is impressive by its realism. What I miss most in terms of realism is of course the physical sensations of flight (g-forces, plane vibrations, etc.). Normal, and I guess I'll have to live with it. I'm sure I'll survive all right. Another thing that I find difficult to cope with, is the "wrist" joystick. I read several posts about joystick mods, whereby people have lengthened the joystick shaft, and thus increased the realism (and perhaps precision) of sim flying. I have a Thrustmaster T16000M which I find is great. However, I find that "flying by the wrist" to be much less realistic than the feel of a real stick. I could go ahead an try to DIY my own mod, but before doing this I wanted to get a feel of what you guys (and gals) think of it, how many people fly with a stock joystick or a modified one (extended shaft length). Is it worth going through the mod adventure or shall I stick to stock T16000M and hope for the best? Last edited by Noofy; Apr-12-2019 at 14:29. Cant help you with your specific question Noofy but you might enjoy a Microsoft Sidewinder Force Feedback 2 joystick ??? - you have to search them out on ebay but they are excellent . The force feedback makes a real difference..
Good to see you on the forums . There are quite a few guys who use a lengthened joy stick so I'm sure you'll get some positive feedback soon . I wanted to compliment you on your flying and say you are a very tricky opponent and have very much enjoyed locking horns with you on the server . I'm look forward to doing so again soon . When we see your name on the stats list myself and others certainly take note that you're around . You are a very welcome addition to our community . Modify it so its what you want. Mine sits low... and has a long extension. Replicating the throw you see in cockpit. So... no easy answer really... play about and see what works for you. Last edited by ATAG_Highseas; Apr-12-2019 at 18:20. What’s the bicycle break for? Because extensions are available as add-on and is basically "bolt and play", and because they believed that their control precision increase. Between ones that use "entry-level" (e.g. T.16000M) or "mid-tie" sticks (Saitek, CH) extensions are less common, most because ready to use extensions are not available and for install one 'DIY' is need cut, mod, glue, solder wires...- or, make a permanent modification in joystick. The benefit of use an extension (the alleged "realism" is debatable) is that is required less physical movement of hand/arm for make the same control tilt the wrist. This give a perceived "better precision" control (the electronic precision is negligibly smaller). Article about extension in this old number of Computer Pilot magazine (free). Last edited by 1lokos; Apr-12-2019 at 23:12. Ok fine its not. It's my analogue brake axis. 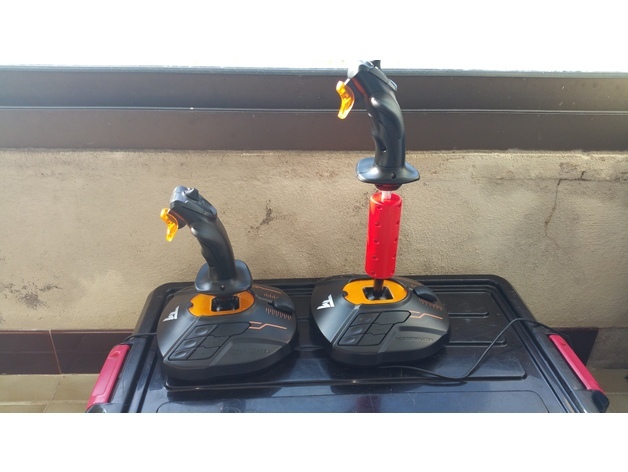 The virpil grips have one. I wanted one on my warthog grip. Im new here too noofy. recently picked up a MS sidewinder ff and it made a huge difference for me. Just plugs in and works perfectly with windows 10 too. Although I cant compare it to the real thing as ive never flown a real aircraft. But as far as the sim goes think its a good stating point . Im quite interested in a modded full length stick too but wouldn't know where to start . Sidewinder is pretty good. It doesn't break the bank either. I still have mine even though I've not been using it for a while now. Noofy, as stated above, I really enjoying winging with you. You help make me a better pilot and you seem to spot the opposing planes so well. I use the MS FF joystick also and it does help with flying, maneuvering at close to stall speed. Came across this. if you have more money than sense . surely something like this could be homemade for a fraction of the cost . And look at what Nails has done. And it's fun for all the family. I never even thought to ask. Starting with getting a table which has a dent in it above the stick. Plus a thing to fix the joystick somewhere between the floor and the table between the legs. But before jumping into such project I'd better fix my SW crashes problem. 3D print parts for T.16000M extension. Noofy, I was able to book one at local library and they helped me set the printer up at no cost other than for the plastic, which is much less than a cup of coffee (and much much less than a cup of good coffee!). More tea vicar? And please do help yourself to another garibaldi. Well said, Knighty! Couldn't agree more... and I think we can add Zappay and Gerald to that list. There are lots of new pilots coming on to the servers and that's fantastic to see. They add so much to everybody's fun! Stick with us in Cliffs, lads, and you'll have a ball! Hey Seas...great work on extending your stick...very impressive! Now, I need a new kitchen fitted and a loft conversion built. I have 'a window' next week. How ya fixed? Salute! Had a look at what Nails has done. that is amazing. Although think my other half would go mad if I had that in the spare room lol . Last edited by TWC_Sp00k; Today at 06:37.